Hope everyone has had a great year of running and can keep up the good progress made in 2013. The weekend saw the Delamere Park run but we also had the club handicap last Wednesday. Thanks for Jackie for sending me a ‘race’ report as below. After a fairly dry day, the weather forecast was spot on for Wed evening; “a strong weather front of heavy rain, wind and hail will come in 6ish and be at its strongest for the next 2 hours”! This made for a gutsy 3 mile sprint to Godscroft Lane and back; a challenge for everyone, particularly those in Xmas outfits! Against the weather on the way out, helped (???) on the way back. The start was moved so that we could shelter under the partially covered Tesco trolley park. Strict instructions were given that the steps onto the main road were out of bounds, so extending the course by a few hundred metres! 37 runners set off, avoiding shoppers, for the highly competitive sprint. Due to stopwatch malfunction, soggy record sheets and raffle ticket problems, only finishing positions were recorded; and only the first 25 places are reliable as after this runners were so focused on aiming for the shelter of Tesco they missed the finishing line! Anyway from the reactions afterwards, an exhilarating race was had by all and this was rounded off by a great evening back at the club (I bet even the showers were welcoming) with secret Santa and a tasty choice of curries from Sher Khan. Thanks to Joe & Mario for riding the storm at Godscroft Lane, Ben, Kathryn & Helen for helping at the finish and Dave & Lesley for organising the food. Well done everyone, particularly to newcomer Ray Duffy who won the prestigious Xmas Handicap Trophy. Looking forward to seeing Ray and all the new members wear their Helsby vest in 2014! 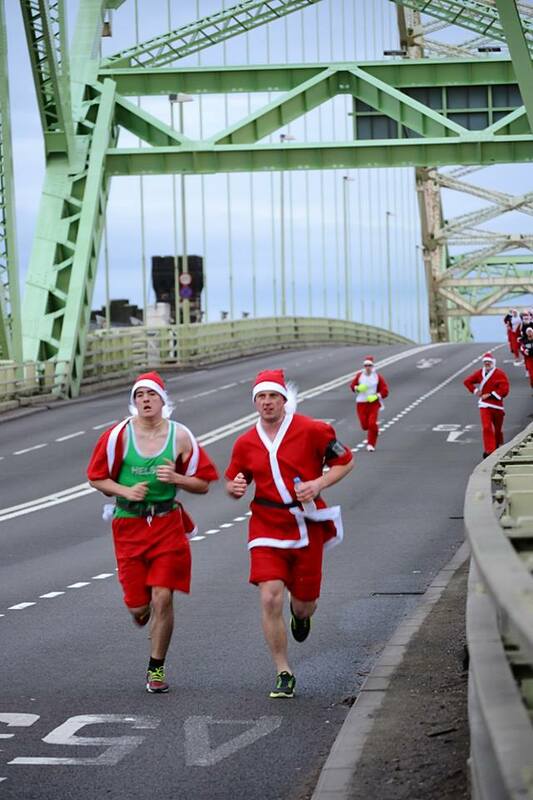 A Happy Xmas and New Year to you all and here’s to some good running and races in 2014! Apologies as I don’t have placings for Graham Lloyd, Tim Igoe & Clive Twrie. At the end of the evening there were a couple of prizes leftover, given that it was a secret Santa, some folks must be missing one. Please let me know if you missed out! Well done to Colin Bishop for his usual podium place at the Delamere Park Run 5k last Saturday and to Stephen Wiggins for his PB. Louise was first Helsby lady. Full results below. Early round-up this week as all results are in. Two park runs this weekend, Delamere and York both on Saturday 7th December. This weekend saw the 39th Delamere Park Run and even with a cold Helsby’s Colin Bishop managed to secure his usual podium place! I also believe Charlie Ashbrook received his 10 park run t-shirt, so well done to Charlie. Rachel Arnold was first Helsby lady home. Congratulations also go to Donna and Paul both securing course PB’s. 7 runners out for Helsby. A little further than Delamere Ben Williams took on the York Park run where Ben was 65th in 22.59. Full results for the York park run are available as below, not a bad time for the winner it seems! Anyone else been further afield than York to do a Parkrun? Saturday afternoon was the 3rd race in the Liverpool & District XC League at the great Stadt Moers course over in Knowsley. For those who missed this race the course is repeated (minus a small first lap) in a few weeks for the Sunday League XC. Well worth a trip! This particular race was a club counter over one small lap and three large laps accounting for just under 10k on what is an undulating course. (Spikes a must have!) It was a really good standard for this race too with the likes of Johnny Mellor in the starting line-up among others. Jayne Joy shone on the day with a podium finish and tore up the ground after the first couple of laps to close a big gap and finish just behind 2nd lady. Make sure you congratulate Colin on his win and for Roy also on the podium and to Tom for his top 5 finish. Hopefully we’ll see Colin’s winning performance make the front page of the Runcorn Star. I’ve had no other results through but if I’ve missed anything out as always please let me know as I can update as necessary. This weekend saw the Delamere Park Runs 38th race, with Colin Bishop on the podium and Ivan in a top ten placing. First Helsby lady was Helen Tudor. Full results can be found at the link below. Overall this means Helsby means team are still 4th in the table and Helsby ladies are now in 2nd place. Three of the committed fell contingent at Helsby were at the Telford Harriers organised Cardington Cracker on Sunday. This is a 9 mile race with 2600ft of climb round the Shropshire Hills with first home for Helsby Chris Baynham-Hughes followed by Jimmy and Andy. A big field and a great course by all accounts. More information and full results can be found at the link below.